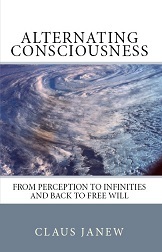 In What is Consciousness? (I) we have considered the formation of i-structures by circumscription and in "What is Awareness? (I)" the alternation of perspective as such. But basically, both are one and the same. Circumscribing movement – consciousness – is of course an alternation of individual viewpoints. And perception of an alternation – awareness – also circumscribes a constant center. The difference between emphasized circumscription and emphasized alternation lies in the density of the circumscribed central area. 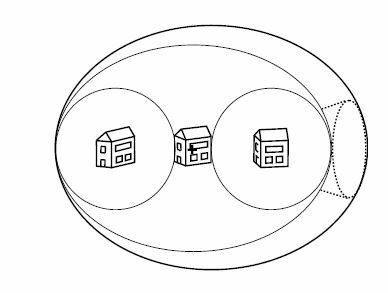 If the circumscribing alternation (for example, between facades) forms an object (a house), the content-dense center symbolizes its unity ("being inside"). If the alternation is perceived more as such, the object character is thin ("Are there several houses or one?"). Now, however, the "trace" of the alternation (the sequence of facades) is more or less curled up in the memory, that is compressed, and the respective awareness is incompletely conscious of the entire alternation (say, between three bare walls with corners and a few windows). The rest (more windows, attic, back wall) leads into the just-not-conscious, into a narrowing. Awareness includes a consciousness of this transition ("closer, to the back"). Yet consciousness is in a sense the "upper" section of awareness, whereas awareness as such includes the just-not-conscious "further down" by alternating with it. This is more than a point by point transition or a coagulated potential. Out of the alternation between the conscious and the subconscious, the awareness "receives" impressions and ideas, so to speak, which escape the more static consciousness ("a chamber somewhere"). 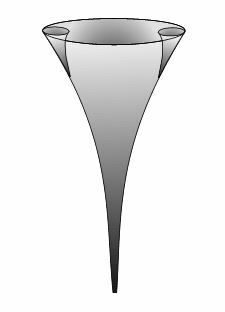 All in all, consciousness resembles a funnel whose rand represents the circumscribing (alternation) movement which is compressing and narrowing itself and transitioning to the just-not-conscious with the funnel's stem. Only the center point of the whole movement is always remaining conscious. The awareness, in contrast, is following the stem to the other side ("to the back, around the corner"), meaning it is switching to the consciousness there, whose stem is leading back again. The difference is not strict: Consciousness is always awareness! Awareness is also conscious, but points beyond that and involves always more than what is just now conscious. Alternation does not allow it to be nearly frozen. With the consciousness we only try to ignore this, and then its own changeable nature escapes us, the awareness, from which it "unscrews." 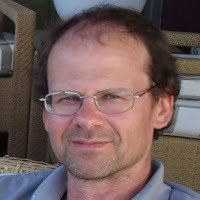 The connection of awareness and consciousness has also been indicated in Individuality and Reality: By alternating individual perception, a common approximation is being constructed, a conscious reality (a rolling pen, a house). 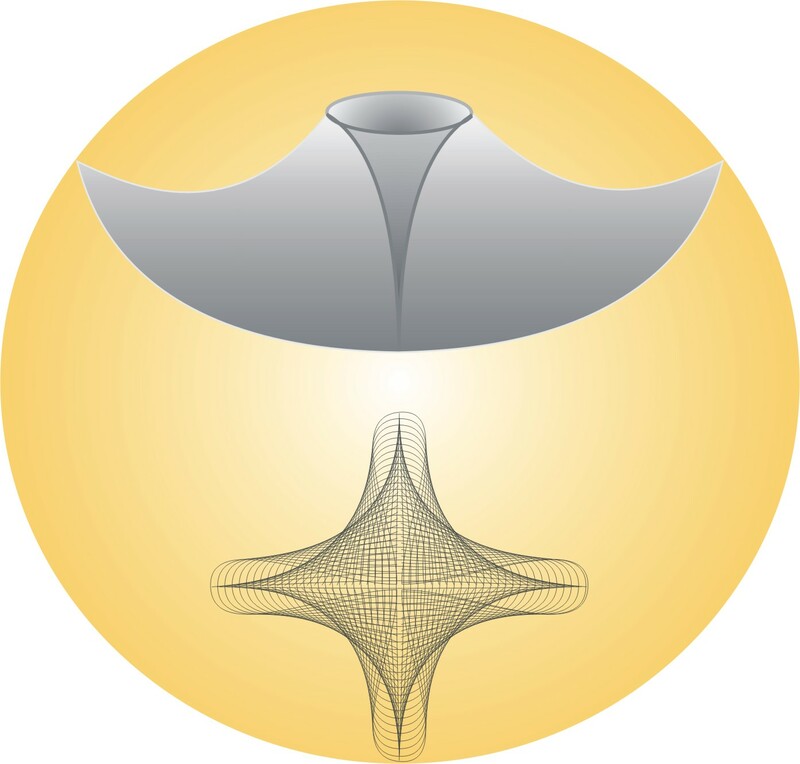 Because the alternation coiling is compressing itself while forming approximations and the alternating standpoints are "vanishing" in the funnel stem we do not have an overview of the reality formation. However, since consciousness always creates approximated commonalities the consciousness funnel is a reality funnel. It creates reality out of the funnel stem by approximating individualities into one consciousness, but nowhere by relinquishing them. Everything remains awareness. 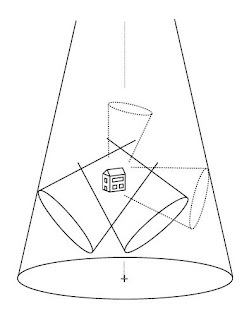 Figure 1: Presented above is the circumscribing compression in the reality funnel. 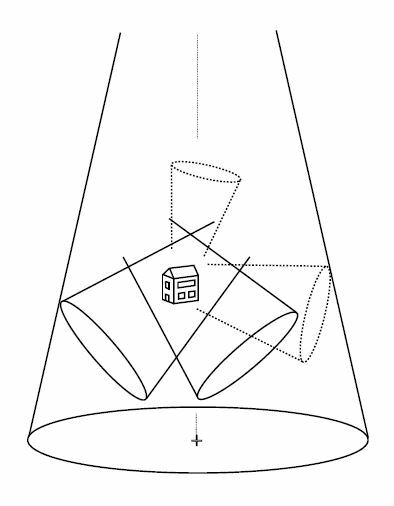 Below is a possible top view of how the alternation of perspective condenses into a seemingly stationary object consciousness. 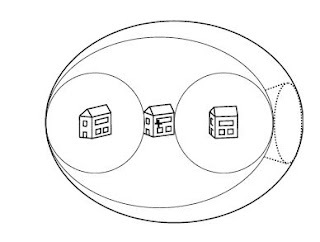 Figure 2: Here, Figure 1 is summarized and further simplified. This time I emphasized the overall movement of perspective and the resulting spatial object awareness.